Gigabyte may be best known to computer enthusiasts for their motherboards and graphics cards, and now their product line has expanded to include complimentary peripherals. 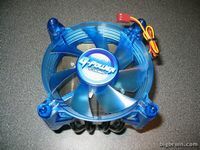 The Gigabyte G-Power Cooler Pro is a universal CPU cooler designed for use with Intel Pentium 4 processors (Socket 478 and 775), as well as K7 and K8 AMD processors. 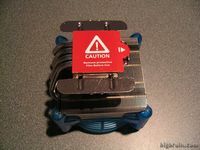 The striking appearance may appeal to enthusiasts, but this review will take a look at the performance of this heatpipe cooler to see if it is about more than just good looks. Heatpipe coolers have become the new design of choice for cooling processors effectively with minimal noise. The Gigabyte approach employs four heatpipes that draw the heat from a small copper core up to a large radiator elevated above the CPU. A proprietary fan forces air down over the 110mm x 110mm radiator, while also adding some visual appeal with four blue LEDs. 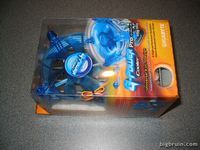 The G-Power Cooler is available on its own, or as the G-Power Cooler "Pro" with an included fan controller, which this review will focus on. 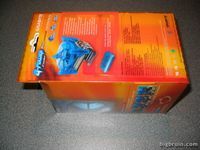 The Gigabyte G-Power Cooler Pro is sold in the atrractive retail box shown below. You get a good look at the product, as well as all of the key features and specifications printed on the various sides of the box. 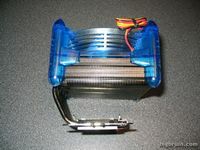 The cooler itself features a large, translucent blue fan mounted on top of the heatpipe assembly. Upon first inspection one might think the four LEDs would be embedded in the knobs at either corner of the fan, but taking a closer look shows that they are actually located behind the fan closer to the center hub. The LEDs are just out in the open, mounted to a small bracket, which is a fairly unique design in my experience. Taking a look at the sides of the cooler assembly reveals a few items of interest. One is the slotted, tapered design of the fan's sides. This design is intended to reduce noise while allowing maximum airflow through the radiator. The radiator is then a densely packed array of aluminum fins through which the four heatpipes pass. 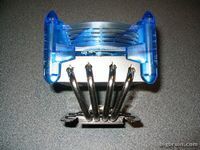 The radiator and fan are suspended well above the base of the cooler, and the only structural support comes from the four heatpipes themselves. Despite the radiator being constructed of aluminum and the cooler's base being constructed of copper, everything has been coated with nickel to give it a uniform, chromed appearance. 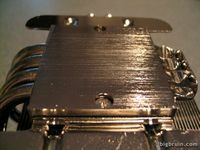 The cooler's base features two large tabs surrounding the portion which will make contact with the CPU. A large red sticker is placed over this surface to protect it, and once removed it can be seen that although it is flat, the surface is not particularly smooth. Running a finger over the exposed base feels smoother than it looks, but machining marks are obvious in the below right image. As mentioned, the base is supposedly constructed of copper, but I did not remove any of the nickel to confirm this statement.